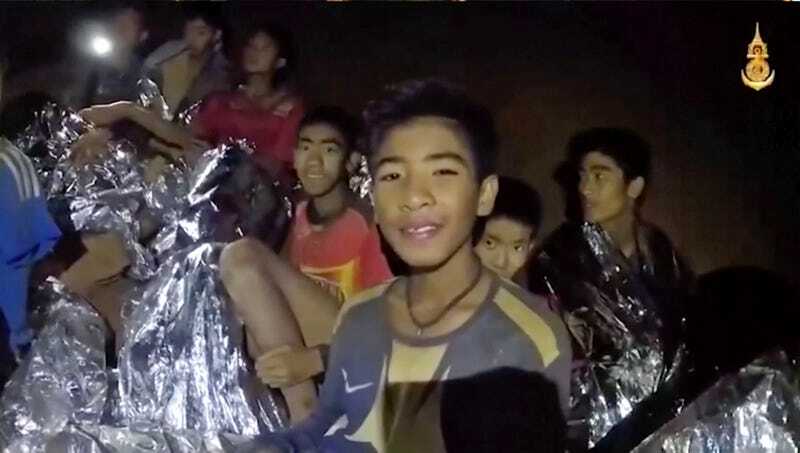 Earlier this week, 12 Thai boys from a youth soccer team and their coach were discovered by diving experts trapped in an air pocket deep within a submerged cave system. Water levels within the cave complex aren’t expected to drop for months, but a daring plan to rescue the boys is now rapidly taking shape. To quickly recap, the dozen boys, aged 11 to 16, and their coach, age 25, entered the Tham Luang Nang Non cave in Thailand’s Chiang Rai Province on June 23, but rising waters from heavy rains stranded the soccer team deep within the cave system, about 1.24 miles (2 km) from the entrance. On July 2, a team of Thai navy SEALS and two British cave diving experts found the team huddling on a muddy, elevated rock. Video taken at the scene showed the boys were okay, though they were in a weakened state from having to go without food for nine days. As of yesterday, a doctor and a nurse have joined the members of the “Wild Boar” team inside the cave, provisioning them with easily digestible, high-energy food with vitamins and minerals. The joy of their discovery, however, quickly turned to dismay as it quickly became apparent that the boys weren’t going to leave their predicament any time soon. The long, convoluted route to the entrance is completely inundated with water, save for several air pockets along the way. What’s more, the water is thick with mud and visibility is practically nil. Some sections are so narrow that divers can barely squeeze through with their oxygen tanks, and the flow of water is very strong in other areas. To make matters worse, the monsoon season is expected to last for another four to five months, and water levels aren’t expected to drop until then (human intervention notwithstanding). Discouragingly, some of the boys don’t even know how to swim, let alone have any familiarity with scuba diving. Medicine and food are now being transported to the scene, and a backup plan would have the boys waiting it out in the cave until October or November. A four month supply of provisions and medicine has already been assembled should it come to that. But Thai officials would rather that not be the case. 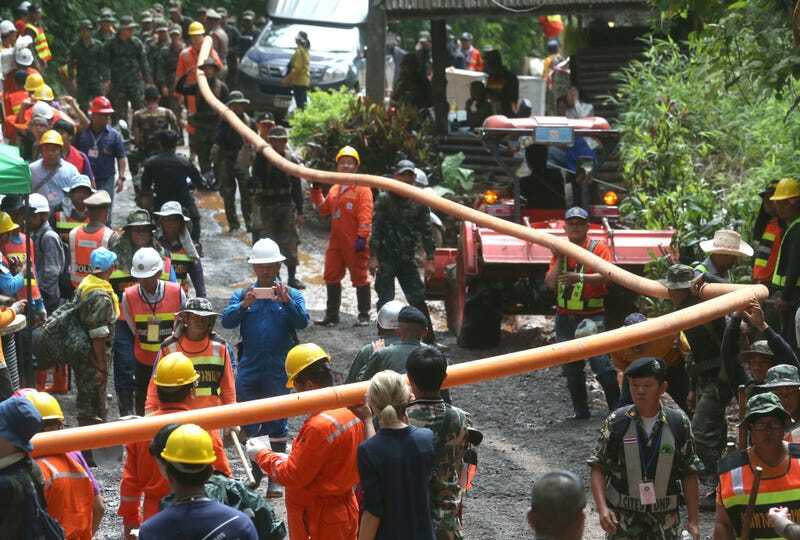 Rear Admiral Apakorn Yuukongkaew, who’s commanding the Thai SEALs unit, admitted that weather is an ongoing concern, but he said the boys will be taken out safely as soon as sufficient water has been removed from the cave. He didn’t elaborate on either of those plans, but as The Guardian reports, around 32 million gallons (120 million liters) of water has been pumped out of the caves since late yesterday. The boys are also being given a crash course in swimming and an introduction to scuba diving. Thai officials are currently in conversations with Mermaid Subsea Services in Bangkok, a firm that normally provides equipment for undersea oil and gas extraction. The company is being asked to supply diving masks for the kids. Ideally, AGA Divator masks would be used, which cover the entire face and are specially fitted for children. 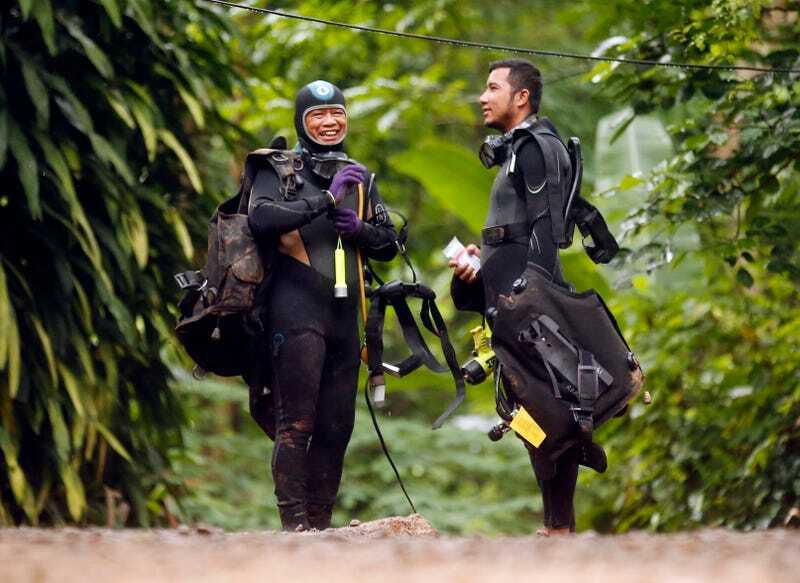 Ruengrit Changkwanyuen, an official with the Thai contingent of the international cave diving team, said the boys will also be equipped with wetsuits (the water is very cold), boots, and helmets. Removing all the water from the cave system is likely not possible, but once levels are sufficiently low, the amount of time the boys will have to spend submerged will be minimised. Timing will be critical; officials will have to weigh the conditions against pending weather reports. Once the rescue gets underway, a static rope, which is already in place, will guide each boy and his respective rescue diver through the murky, rushing waters towards the entrance—or, more appropriately, the exit. Alternately, a team of rescue divers would position themselves along the route, passing the boys to each other in a relay style. The journey could take as long as three hours or more, so stage tanks will be positioned every 80 to 160 feet (25 to 50) meters in case oxygen levels start to run low and tanks need to be replaced. The boys will not be expected to carry their own oxygen tanks, instead relying on tanks carried by their rescuer. Ideally, only one boy would go at a time to prevent bottlenecks. Officials are already in the process of recruiting Thai-speaking divers, which should help to keep the boys calm and collected during the arduous journey. The dark, claustrophobic conditions could easily induce panic among even the most experienced divers. Using mining equipment to dig a passageway to the boys is not being considered, given they’re located about 3,000 feet (1,000 meters) below the top of the mountain. That said, teams are currently scouring the mountain looking for alternative ways into the cave.